Restaurant owners agonize over the foods they serve and managing their staff. What about the impact of parking on their business? Some restaurants pick the most popular locations. Crowds visit everyday; however, there is less parking than the total seating capacity of all the restaurants. Such is the case for the popular Marketplace mall in Cupertino, CA, as well as the new strip mall near the Cupertino High School. Despite paying higher rents for the popular location, many of the restaurant owners discover that they gain fewer customers because of the parking limitations. 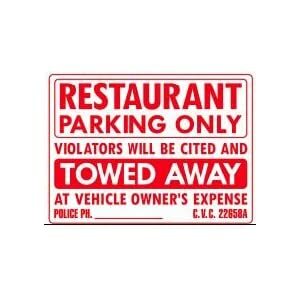 Conversely, you've seen these signs that restrict parking to customers only. These municipal codes are rarely enforced. Mobile apps allow customers to pre-order, double-park, and receive their foods. This has improved the service for those restaurants with limited parking spaces. With the latter case of parking used by neighbors, we found that with active enforcement, business improved 30% for J&J Hawaiian BBQ, also in Cupertino. People often parked in their lot and eat at a sandwich shop next door. By enforcing politely, customers now have a substantial parking problem. Once parked, customers have a choice to leave and find parking; or eat at J&J. Half opted to eat at J&J. Also, with more space available, regular customers found it easier to get in and out. Because the parking lot is friendlier to trucks, such as ambulances, large vans, and towed vehicles - the spot has become like a popular truck-stop. Between the better image/service from mobile apps and enforcement of the parking, J&J's business has doubled this summer over the same time last summer. MoAPPo enables online ordering from smartphones like the iPhone, Android, Blackberry, Palm, and many featured phones using a webapp. It's simple to use - and takes only one minute to complete the set-up; and seconds to place an order. Sign in - Use your email to sign in. A 4-digit, easily changeable pin protects the account. The email is saved on your phone to reduce steps for new orders. Save payment data - Tap the Secure Profile tab to enter your credit card details. MoAPPo accepts Mastercard, Visa, Amex, and Discover. When an order is placed, the 3 to 4 digit CVC code from the back of the card is required. This CVC code is like a pin number that protects your account. This information is not saved on the phone or in our database. Save time - Order by selecting items from the menu. Once the account has been created, you can sign into any of the restaurants in the MoAPPo network, like the 15% of the best restaurants in Cupertino. For re-orders, it's a few taps from your wallet of past orders. Every account is triply secured: via the passcode on your phone, the pin to your account, and the CVC code for your credit card. Yet, it's simple for the owner of the account to remember this information. Consumer Habit Change - Evolutionary or Revolutionary? Mobile commerce is the latest technology trend. Will the user adoption be evolutionary or revolutionary? Traditionally, change evolves through multiple phases. Customer learning time, small changes in user-interface, and account set-up times become barriers to adoption. More recently, customers have dropped mice in favor of touch screens; eliminated the need for floppy disks and hard drives; and integrated their cameras, music box, game players, and cell phone into one smartphone. Sea-change has occurred at an unbelievable pace. Which pattern applies for mobile commerce? Today, some customers make a phone call to request takeout orders. With foreign workers handling the phone line, ordering by voice can be difficult to get the exact order correct. 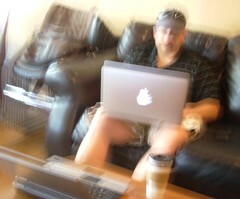 Further, customers usually call when the restaurant is busy - thus, resulting in slower services. We believe many of these customers have switched to online ordering. For pizza, over 32% is already via online sources. It's a small habit change to switch from online to mobile ordering. These customers will lead the wave to mobile commerce adoption. Most customers like to wait in lines: wait to get the menu, wait to order, wait to pay, and wait to receive foods. The cool pattern is to find a seat, order/pay via an app, and relax with their meal and conversation. Surprisingly, this has been a tough habit to overcome. Some customers complain that this is jumping the line. Doesn't the phone-in order jump the line as well? Some customers like the interaction with the owner. Ironically, if the owner takes fewer orders, won't they have more time to socialize with their customers? Most customers simply admit that it's cool, but they forget to use the app. Mobile commerce improves the restaurant ambiance - as cashiers and waitresses become less hasseled, and more service friendly. MoAppo is early in the adoption curve. We believe that we need to be prepared for rapid adoption. Only time will tell. The next big wave for technology is mobile commerce. What are the platform challenges to service this pioneering market? Designing the MoAppo system for storing a catalog of products or food items; and allowing users to order and pay for items has been a trivial problem. Designing the true killer platform requires resolving a multitude of moving parts. Most menus have, at most, a single, lo-res, small picture for each food item. As a result, the menus are boring, uninteresting, and fail to engage users. In addition, most photographers will tell us that shots of food are boring, at best. Using the unique, tested methods from our Keys by TEARN edutainment platform (ie over 8 million downloads), we crowd-source relevant, hi-res slide-shows for every product and item in a menu. This creates an engaging presentation that allows new customers to discover interesting, new dishes. The slide show easily replaces thousands of words - and get the salivary glands working. This single feature already makes MoAppo the technical leader in mobile commerce. Most competitors choose between the WAP platform - which works on any featured phone, but without images; and native support for single platforms - like the iPhone. Neither approach has gained much success. Using our unique, cross-platform methods for animating the menu (ie the cool, sideways elevator bounce) that supports iPhone, iPad, Android, Blackberry, Palm, Windows, advanced feature phones, and online use - extends our technical leadership far beyond any existing competitor. Is this the right mix of cool versus functional support? Time will tell. A payment platform requires security against users, devices, man-in-the-middle, and server attacks. Such platforms often are burdened so badly that a single server can only handle a few hundred transactions per second. We have chosen to use the NoSQL and NodeJS platforms that dominate the modern social media and mobile gaming technologies. With a multitude of innovations, we have produced a secured system that has unique self-healing, live-reporting, redundant paths to the end-points at retail locations; while having a robust structure that can handle hundreds of thousands of transactions per second. No other company matches the maturity of our platform. Note that this is a 10,000x improvement over legacy systems. The system has been tested with a dozen merchants, without a single fail, over the past two months. In summary, the MoAppo Platform has required half a dozen, patent-pending methods that supply the services for mobile commerce. Stay tuned to follow our progress with this latest venture.